Cook time: 1 hr. and 10 min. Comments: This dish was “OK”. Not bad, not good, just OK. The family didn’t particularly rave over the taste, but also ate it up. 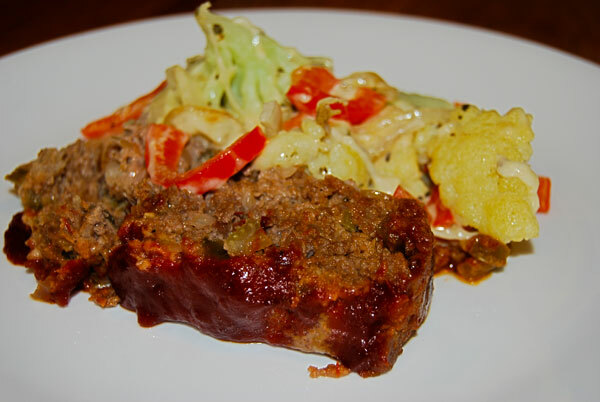 Note that I reviewed a different version of “Grandma’s meatloaf” a few months back…..that EMEALS recipe was FAR more delicious than this. But of course I heavily embellished that one. I think what put off my taste buds is the dry onion soup mix. I have never really cared for that flavor in anything (although I grew up with it – my Mom used it all the time in casseroles). The side dish was easy to prep and cook, and it too was “OK”. Again, the fam ate it all up, so couldn’t have been bad ! Sautee onions and celery in a wee bit of olive oil. Combine all ingredients except the Chili sauce in a large bowl and mix (use your hands ! ), and form into a loaf. I used two bread pans, since I froze half of the recipe. Spread Chili Sauce (or ketchup) over the top of the loaves, and bake at 350 F for 1 hour. Let stand for 10 minutes before serving. This gives you just enough time to make the side dish. Cook the cauliflower in the microwave with lid and a bit of water for 7 minutes. Sautee onion, pepper and garlic in a wee bit of olive oil – since I use a nonstick pan, I don’t use much. Drain cauliflower and add to skillet. Add basil, salt, pepper, cream, and cheese and stir for a couple of minutes until cheese is melted.